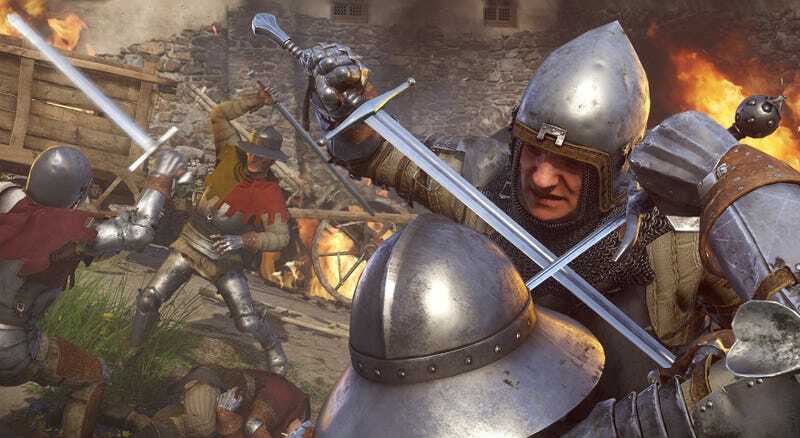 When Kingdom Come appeared on Kickstarter back in 2014, developer Warhorse promised that the game would be different than other RPGs. “Dungeons and no dragons” was the tagline, taking a not-so-subtle swipe at the glut of heroic swords-n’-sorcery fantasy games like Skyrim, Dragon Age, and The Witcher that characterized the genre at the time. Warhorse wanted to offer a world nearly on par with those games in terms of scale, but with more realism, more immersion, and more attention to detail. That pitch resonated with would-be players to the tune of over $1.5 million, nearly four times the initial goal. You don’t have to interact with the majority of these system, and many players probably won’t. Immersion, as gamers define it, is often more about choice or the illusion of choice than it is everything working correctly or living up to particular standards of historical accuracy. Kingdom Come’s systems—especially ones that involve AI—frequently trip over themselves, clumsily yanking back the curtain during moments that should be immersive or authentic. But many players consider that excusable, because having options at their fingertips is more than enough to make up for it. As long as there’s enough systemic window dressing, the rest is fine. In January of this year, Vávra issued a statement retroactively re-contextualizing his stance on Gamergate, claiming that for him it’s always been about “freedom of speech and the freedom of opinion and thoughts,” rather than the clear sexism, racism, and harassment that the movement peddled in from the get-go. “I am not a friend of any kind of totalitarian rule and consider the accusation that I am a Nazi or close to any ideology that even remotely goes in that direction therefore as absurd, even personally offensive,” he added. These days, alt-right groups (and worse) thrive on Steam because it’s not moderated in any consistent way, with Valve taking a hands-off approach and leaving developers to enforce rule sets that apply in their personal community spaces and nowhere else. It’s even more lax than notoriously troubled platforms like YouTube and Twitter. Steam’s community is, of course, not made up entirely of users who engage in these sorts of behaviors, but it’s become one of the platform’s most prominent cultures. Correction - 3:10 PM, 3/2/18: The original version of this story misstated the nature of a photo tweeted out by Kingdom Come director Daniel Vávra. The photo is in fact a still from the movie Black Knight. We’ve since corrected the error.